Spaghetti squash is the ultimate pasta substitute for folks who are keeping a close eye on their waistlines. When cooked right, this gourd produces thin, spaghetti-like strands with a fraction of the calories of regular noodles. Aside from being a low-calorie and low-carb delight for paleo diet followers, the spaghetti squash produces a huge amount of food at a low price, which makes it the perfect choice for health-conscious families. Did you know an average-size spaghetti squash yields about four servings of “spaghetti”? This means for less than a few dollars, you can feed your entire family a healthy dish — and you might even have some leftovers! Cooking spaghetti squash isn’t hard. You simply cut it down the middle, season it, bake it and then scrape the spaghetti out. 1. Preheat the oven to 375 degrees. Push the buttons. Do it. 2. Cut the spaghetti squash in half lengthwise, and scrape out the seeds. Cutting this squash isn’t easy, but with a little muscle, you can do it. Make sure you cut from stem to tail and use a spoon to scoop out the seeds. 3. Lay the halves on a baking sheet squash side up. Drizzle each half with olive oil, and season it with salt and pepper. A little goes a long way. 4. Place the halves in the oven for 35 to 45 minutes. Remember when you used to turn the oven light on and watch your food cook? Now’s the time to relive those moments. 5. Remove the squash from oven, and let it cool. You can tell the spaghetti squash is done cooking when you can easily stick a fork in it. Sometimes, the top layer of squash will have browned — this is because of the olive oil. 6. Scrape out the “noodles” with a fork. Ta-da! Nice work! Aside from cutting a spaghetti squash in half and baking it, there are other ways you can prepare it. Pressed for time? Cook it in the microwave. If you’re strapped for time, consider making your delicious spaghetti squash in the microwave. To do so, fill a casserole dish with about 1 inch of water, cut the squash in half, and lay each piece facedown in the water. Then, cover the dish with plastic wrap, and microwave on high for 10 to 12 minutes. Have all the time in the world? Cook it whole. Puncture the spaghetti squash multiple times with a fork, and cook it the same way as one that’s cut in half, but you’ll need to increase the cooking time to one and a half hours. This method does make it a little more difficult to get the seeds out, though. Heading to work? Throw it in a slow cooker. Life is busy. One of the hardest parts about being busy is feeling like you never have enough time to eat healthy foods after work. Thankfully, you can cook spaghetti squash in a slow cooker. To do so, puncture the squash with a fork or knife, add two cups of water to the slow cooker, and cook on low for eight to nine hours. No “pasta” would be complete without some toppings. While spaghetti squash is delicious with just seasoning, you can also dress it up with some delectable toppings. Meatballs and meat sauce: Classic spaghetti and meatballs might be your weakness. 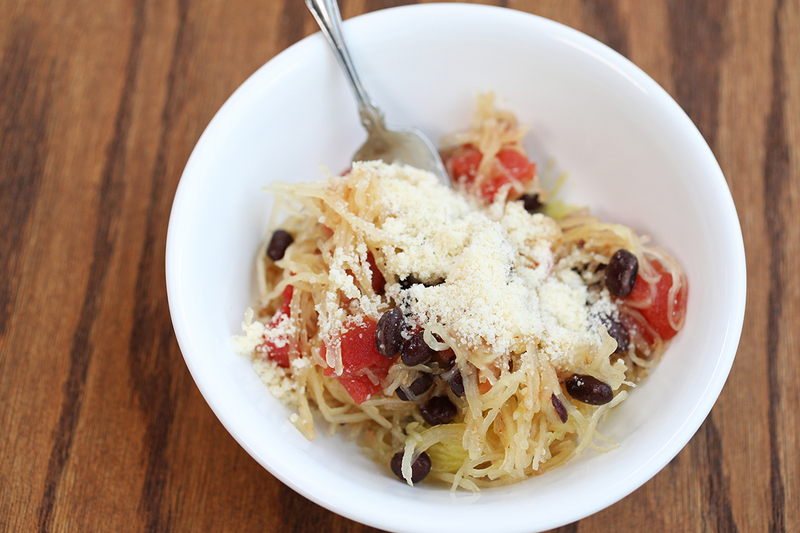 If you want to make it a bit healthier, consider swapping regular spaghetti noodles for spaghetti squash! Just brown some ground meat, find your favorite sauce recipe and add some homemade meatballs on top. Taco-style: You don’t have to give up taco Tuesday in the name of watching your carb intake. Consider adding some taco-inspired ingredients to a portion of spaghetti squash, such as black beans, diced tomatoes, nonfat Greek yogurt (to replace sour cream), jalapeños, corn, etc. Cheesy spinach casserole: In need of some comfort food? If so, opt for a spaghetti squash-based casserole. One idea is to layer the spaghetti with chopped spinach, ricotta, grated mozzarella, garlic cloves and seasonings. Bake to perfection and enjoy!